For the next few weeks, state hatcheries are stocking most trout management waters throughout Maryland. The trout are providing quality fishing close to home and allowing success on a fishing adventure, especially for our young anglers. 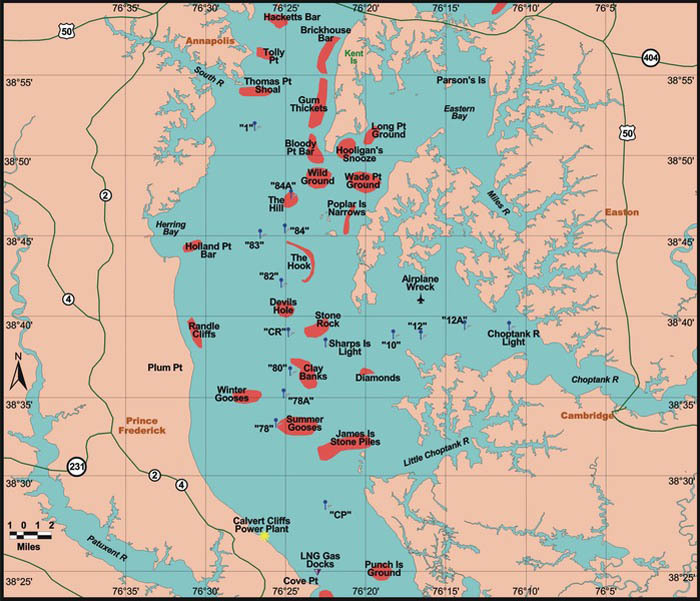 And in the Chesapeake Bay, autumn is one of the most anticipated times for striped bass fishing. Rockfish like the cooler water temperatures and begin to feed aggressively to build up lost body stores. Cooler water also forces baitfish in the form of bay anchovies, juvenile menhaden and silversides to exit the tidal rivers and head down the bay. This is a time for light-tackle vertical jigging with soft plastic or metal jigs. The advent of braided line has given anglers increased sensitivity; make sure to check the first 10 feet or so of line for fuzzing and damage. There is a new generation of braided line with a clear polymer coating that reduces fiber abrasion. Because it makes the line slick, one can cast a lot farther. Water conditions at the mouth of the Susquehanna River remain stained and chilly. There is a lot of water coming through the Conowingo Dam driving water temperatures down to 63 degrees. Water conditions improve as one moves down the bay, as does fishing success. 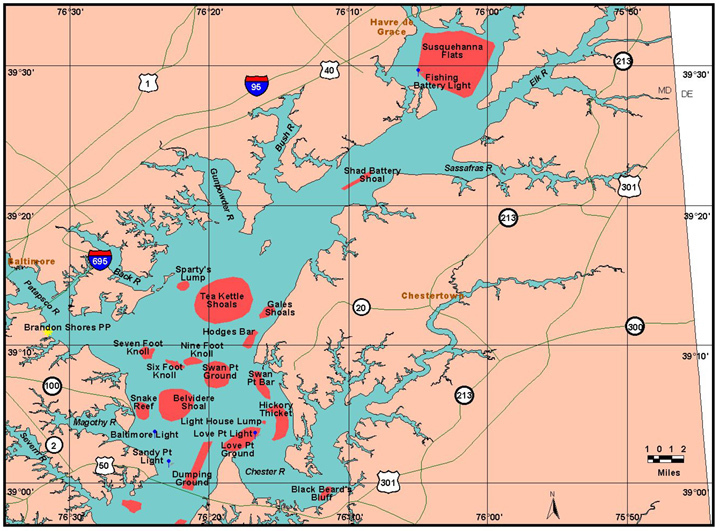 There has been good success in the Baltimore Harbor area for those casting topwater lures and swimshads near shoreline structure or jigging along deeper structure such as channel edges and bridge piers. Trolling is a good option with a variety of lures. Umbrella rigs behind inline weights with swimshad or bucktail trailers are always popular. Small spoons behind inline weights or planers are very productive, gold tends to work better in stained waters and a splash of chartreuse can help a lot. There are still a few Spanish mackerel around and they will jump on those small spoons. Hoses in green or red often work well as do diving crankbaits. Lastly, bucktails dressed with a sassy shad are striped bass killers and often do well-ftenbeing slowly trolled along shallow edges in the lower sections of tidal rivers. Chumming is being reported to be good at Bloody and Thomas points to striped bass that are holding at 25 feet to 30 feet. Live-lining is nearly done unless you managed to keep spot in some kind of holding pens. A word of experience to anglers trying to hold their spot in a secret location — few fish are more tempting to a river otter. Do not depend on latches; make sure your lids are wired shut. Cooler water temperatures have striped bass freely moving about in the bay and tidal. The shallow water fishery for light tackle anglers casting from boats or shore is very good. The mornings and evenings tend to be the best time to fish. Topwater poppers are perhaps the most fun for spin casters with crankbaits and swimbaits a good option also. Fly casters can use a floating line with skipping bugs or larger versions of Deceivers or Clousers with a sinking tip. A falling tide is an optimum time to fish shoreline structure such as old submerged breakwaters, stump fields or prominent points. 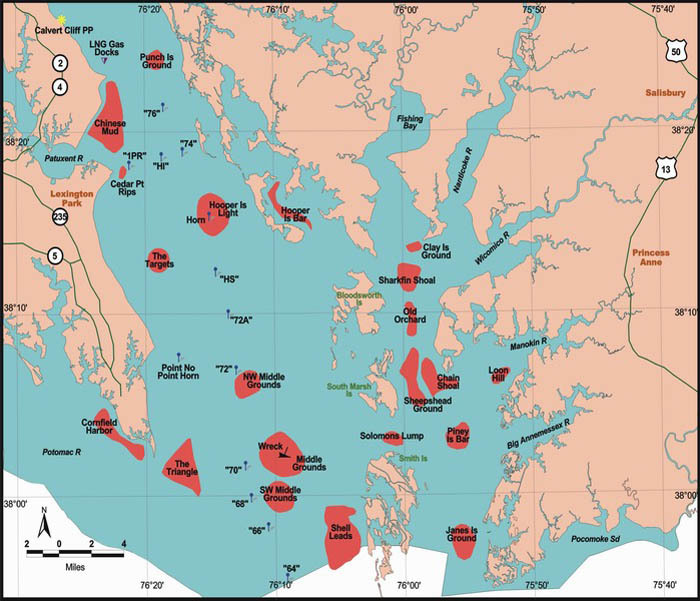 The areas around Poplar Island, Kent Narrows, or in front of the Naval Academy or Thomas Point are just a few of these locations. Striped bass fishing opportunities are spread throughout the region. There continues to be good chumming for striped bass and a few bluefish at the mouth of the Potomac River and near St. George Island. The fish tend to be suspended at about 25 feet. There are a few spot still to be found but not many that are suitable for live lining; most are too large. Trolling has been a popular way to fish for a mix of striped bass, Spanish mackerel and bluefish. Small spoons behind planers along with a mix of bucktails, swimshads and hoses have been some the better items to have in a trolling spread. Some anglers have been surprised to have a few large red drum and cobia hit some of these lures around the Point Lookout area. Both species must be released at this time. 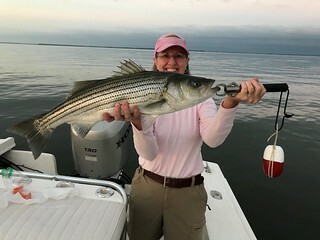 Trolling bucktails dressed with sassy shads and swimshads around shoreline edges in the lower Potomac, St. Marys River and Patuxent is a good way to target striped bass. Breaking fish are becoming a more common sight this week and often diving sea gulls mark the way. Casting jigs and working the jigs underneath the surface action is a good path to larger striped bass. Spanish mackerel and bluefish are part of the mix this week. Fishing the shallower waters along shoreline structure in the tidal rivers on both sides of the bay is a fun, light-tackle way to fish for striped bass. Casting topwater lures, jerkbaits, crankbaits or swimshads to structure such as docks and piers, rocks and marsh edges is both fun and productive. Those who take the time to get out on the water and set a trot line or a string of collapsible crab traps have been enjoying excellent success. As most know the crabs are heavy and full as they prepare for the winter months ahead. The best crabbing tends to be in 10f feet of water or less. Female crabs have been pesky guests at the dinner table and have been chewing up baits but they do hold the key to future crabbing seasons. Deep Creek Lake has settled down from a busy summer season and fishermen have the lake to themselves for the most part. Cooler water temperatures have smallmouth bass and walleye actively feeding along the steeper and rockier lake edges as well as deep grass. Drifting live minnows or using a minnow-jig combination in these areas is a good tactic. Slow trolling nightcrawlers in a worm harness along the dam face or deep grass edges is also a good tactic at about 10 feet to 30 feet. Largemouth bass are active in shallower areas and northern pike can be found at the mouths of various coves. Floating docks are being pulled so those that are still deployed are good places to target with stick worms or soft plastics. The upper Potomac is still running high this week but is falling with fairly clear conditions. Smallmouth bass and walleye have been actively taking spinnerbaits, crankbaits and jigs. Most of the larger smallmouth are being taken on spinnerbaits. 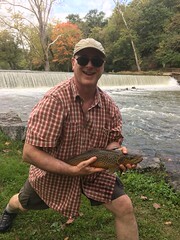 The fall trout stocking program is well underway and the trout are larger than usual for this time of the year, due to the abundant summer rain flowing through the hatchery raceways. Put-and-take areas are being stocked each week as well as catch and release trout management waters. Cooler water temperature and the shortening of daylight hours have caused grass beds to diminish in most areas and these areas are the hiding places for baitfish and crayfish. Both are now moving to deeper waters looking for some sunken wood or similar structure to spend the winter months. Largemouth bass can often be found holding in transition areas between the shallows and these deeper areas. Crayfish are perhaps number one on any largemouth bass’s dinner menu and they will be looking hard for them. It is not uncommon to notice a reddened lip on largemouth or smallmouth bass this time of the year, since they stab at a hustling crayfish before sucking them in. Crankbaits and craw jigs are excellent baits to use and spinnerbaits are another good option. This is a great time to start thinking about stocking up your freezer with mild fish fillets that freeze well. Two such fish that are plentiful, fun to catch and have no daily creel limit are northern snakeheads and blue catfish. Blue catfish can be found in the tidal Potomac, the Patuxent and Nanticoke rivers. The medium sized ones make for excellent eating and it is not difficult to fill an ice chest with a sizable catch. 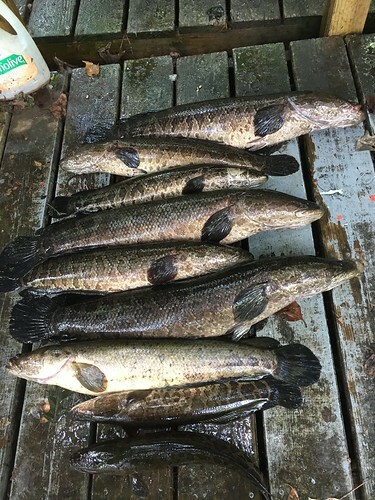 Northern snakeheads can be found throughout the tidal Potomac River and its tributaries and the lower Eastern Shore tidal rivers. They can be caught by casting lures such as buzzbaits, spinnerbaits or by fishing with minnows under a bobber. A mix of kingfish, spot and even a few pompano are being caught by those fishing with bloodworms or squid in the surf this week. Those using cut mullet or finger mullet have been catching bluefish and a few large red drum are being caught and released now and then. 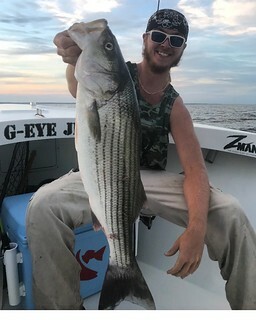 At the inlet and Route 50 Bridge area some impressive, legal-sized striped bass are being caught on swimshads, bucktails dressed with sassy shads or by drifting live spot or eels. There are sheepshead holding tight to the rocks of the south jetty and are being caught on sand fleas. Flounder are beginning to move through the inlet on their way offshore so the inlet and channels leading to the inlet such as the East Channel are great places to fish. Casting or drifting Gulp white mullet lures continues to be one of the best ways to target the larger flounder. Outside the inlet there is some trolling action on the shoal areas for a mix of Spanish mackerel and bluefish. Farther out at the wreck and reef sites and in some areas over open bottom, fishing for sea bass has been excellent with a high number of limits being caught on the charter and party boats. Squid tends to be the bait of choice. There is also a healthy mix of large flounder, bluefish and triggerfish being caught. At the canyons there are large numbers of chicken dolphin being caught near lobster buoys and any kind of floating debris or weed lines. They are mostly being caught on light spinning tackle and small jigs that are often tipped with a little piece of squid. White marlin are being caught and released from the Washington Canyon south to the Norfolk Canyon. 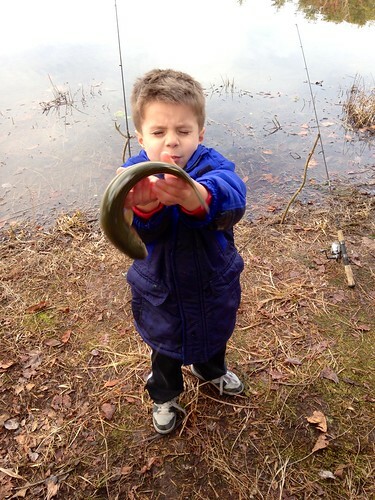 This week’s Maryland Fishing Report was compiled by Keith Lockwood.